Zella Strickland has never turned on a computer. The only one ever in her home was for her husband to use, and after some frustration was quickly discarded on the curb with a sign that said “FREE”. In that spirit, it’s fitting that even with almost every reporter toting a laptop and smartphone, Strickland is one of the necessities of Idaho courtroom reporting that hasn’t changed: A sketch artist. In cases where cameras aren’t allowed, such as in federal court, Strickland can sometimes be seen in the front row of the gallery, set up with her art supplies in her lap, meticulously drawing attorneys and defendants for the media who hire her. In recent times, Strickland has sketched the federal court proceedings of accused terror suspect Fazliddin Kurbanov and the St. Alphonsus vs. St. Luke’s antitrust trial for KTVB. 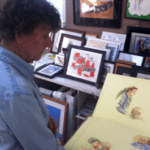 Her courtroom sketch artist career began in 1981, and she has sketched infamous trials in Idaho ranging from those of Joseph Duncan to Randy Weaver to Claude Dallas. On a September afternoon, she allowed me to come to her home and had an array of courtroom sketches out for me to see. They were on a small table, surrounded by her other professional art, ranging from cartoons with silly puns to richly-colored depictions of Basque dancers. Strickland got into “news art” when she was hired by the Idaho Observer to illustrate advertisements and cartoons. The owner, she says, was looking for artists “who were cheap!” which, as a single mom, she says she was. After doing political cartoons and sketching legislators for Idaho Observer stories, KBOI television wanted a court artist. She experimented for a while, and eventually decided her sketches would be with watercolors and markers on stiff art boards. 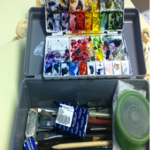 She’d pack up her supplies in a bait box and haul them into court, setting her boards on her lap to draw. That method, though, has not been without flaw in her years in court. Strickland’s most embarrassing moment was during Claude Dallas’s sentencing when the judge allowed courtroom artists to sit in the jury box. Court had already started when she decided to move to a different row and pinched her knee in the swiveling captain’s chair. “I went head over tea kettle, I truly did. And all of those pencils went shooting up in the air, just enormously, you know they’re aerodynamic. Then they started falling in slow motion, hitting those oak chairs, clattering the whole time, and then they … fell on the tile floor, continuing to clatter, while I stayed down there on the floor. Anyway I crept up and looked, and Judge Lodge was just losing it. He had his hand over his mouth,” Strickland said. Strickland quickly grew to love being in the courtroom, saying she’s always been interested in anything different. “I thought it was delicious. If I hadn’t needed any money, I would have done it for nothing just to be there and do it,” Strickland said. Often after she finishes sketches in the courtroom (and as I’ve witnessed personally), attorneys and judges will ask to buy Strickland’s work, which she happily sells. As one may imagine though, they often make a few requests too. “There’s always, could you put a little more hair? Or I forgot I had that bald spot in the back! Or could you put a little color in the temples or take off a few pounds?” Strickland said. What Strickland is looking for when she sketches is getting her work done quickly and accurately. She says she always does the defendant’s picture first, then moves to their defense attorney, and then goes around the room trying to get every person and detail, down to the furniture. “I always told my husband, ‘If you see an American flag, I had plenty of time!’” Strickland said. 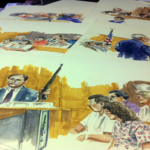 Strickland’s sketches have appeared on KBOI, KTVB, NBC national news, A&E, and many more. Jamie Grey is a reporter for KTVB-TV, and is a member of the Idaho Press Club board.